Tonya DuRoche lives in the Cedar-Riverside neighborhood, employs local workers, and sources nearly all her materials from local vendors. At first glance, the choice to refurbish the chairs in Hoversten Chapel is just good financial management. The move to refresh versus replace the chairs saved the College more than $40,000. But that’s only the surface of the decision. What really went on gets to the heart of what it means to be a good steward. It makes exceptional what could be written off as a one-dimensional, mundane decision. It is a concrete example of how the College can live out its mission to be an engaged member of the community, a thoughtful steward, and a responsible leader. When the College this past summer opted to refurbish the 17-year-old chairs, staff requested a bid from All About Upholstery, a locally owned business. 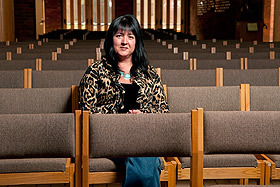 Tonya DuRoche, who lives in the Cedar-Riverside neighborhood, worked with her team to refresh 597 chairs. The job included new upholstery, replacing the seat and back cushions, regluing joints, and touch-up varnishing. It was rewarding work, too. DuRoche, who is committed to her community and other local businesses, sources nearly all of her fabrics from a family-owned company in Minneapolis. That means the money spent by Augsburg to have All About Upholstery do the work had a multiplier effect in the Cedar-Riverside neighborhood. Studies show that money spent locally stays in a community longer than money spent at companies with headquarters outside of that community, state, or region. In fact, the 2004 Andersonville Study of Retail Economics found that $100 spent in locally owned independent stores returns $68 to the community through taxes, payroll, and other expenditures. Money spent at a national chain only returns $43 to the community. DuRoche also hires and trains local employees. She completes a mix of residential and large-scale commercial work for tribal businesses such as casinos and helps stabilize other local businesses by providing suppliers with a fairly steady stream of business. In turn, her suppliers are able to provide a stable income for their employees. This interconnected way of doing business is important to her. To learn more about the work DuRoche does through All About Upholstery, visit her Facebook page.